Sweden is close by (5 km.). A lot of Norwegians conduct daytrips to shop, vacate, or just for the sight. If you come in august, it may be possible to pick berries and musrooms. There are blueberries, red whortleberries, cloudberries, and raspberries. Often, there are a lot of mushrooms as well. Contact us if you are interested in such activities! Riding. A neighbor has hourses. Golf. 15 km. away. We may send you information about golfing and the track. Picking berries. Different sorts depending on the season. Mushroom picking. Different sorts dependent of season. Animal farm. We have nothing but a hen house, but the neighbors has cows, and a large pig farm is not far away. 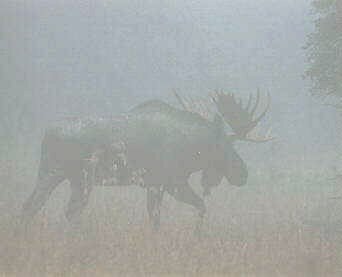 Moose peeping. Do you want to scout for the moose? Or maybe the beaver? Magnor Glass Factory. Factory shop about 20 km. away. Glass blowing. Se web. Barn-dining. We may also serve meals for groups in the “hay-floor”. Ask for a menu! Grocery shop and post office; 9 km. away. The nearest Swedish town is 25 km. away. The prices for the activities above depend on the group size, the season, and others than us (e.g. the golf court). Give us a hint when you order, and we give you the necessary information. We have badminton, volleyball, net, and football which you may borrow.